Cyclic Universal Dynamics by New Physics Dark Matter Black Holes. The Primordial Splitting Big Bang Dark Matter Black Holes Recombine as Tandems and Form Herbig Haro Dual BH Dumbbell Systems. 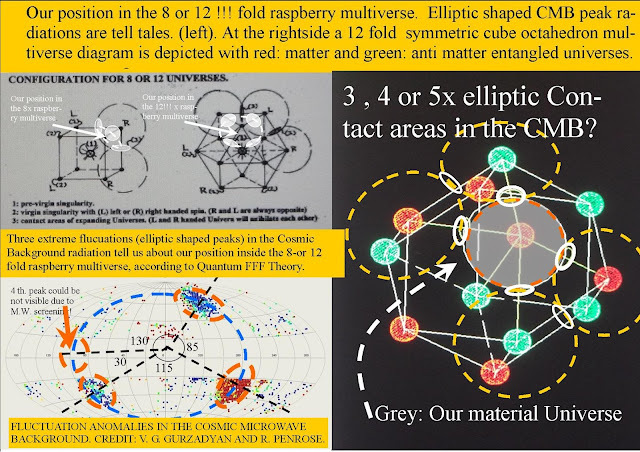 THE 8-12 FOLD ENTANGLED SYMMETRIC COPY MULTIVERSE A HALL OF MIRRORS? 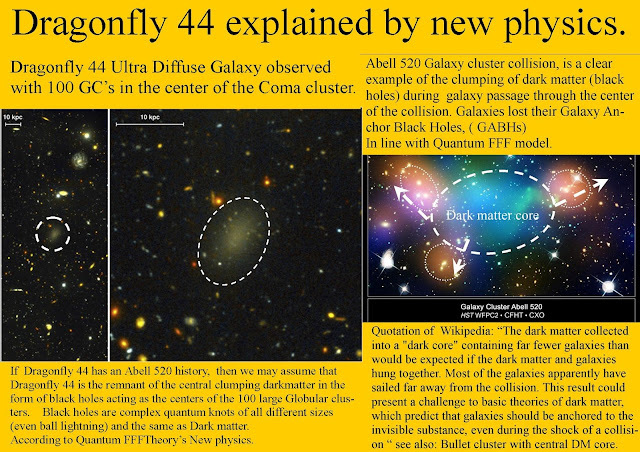 Dragonfly 44 Ultra Diffuse Galaxy explained by Quantum FFF Theory. If Dragonfly 44 has an Abell 520 history, (at the right side) then we may assume that Dragonfly 44 is the remnant of the central clumping dark matter in the form of black holes acting as the centers of the 100 large Globular clusters. 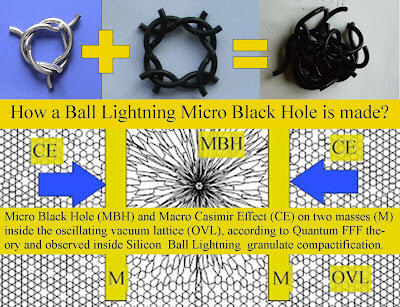 Black holes are complex quantum knots of all different sizes (even ball lightning) and the same as Dark matter. 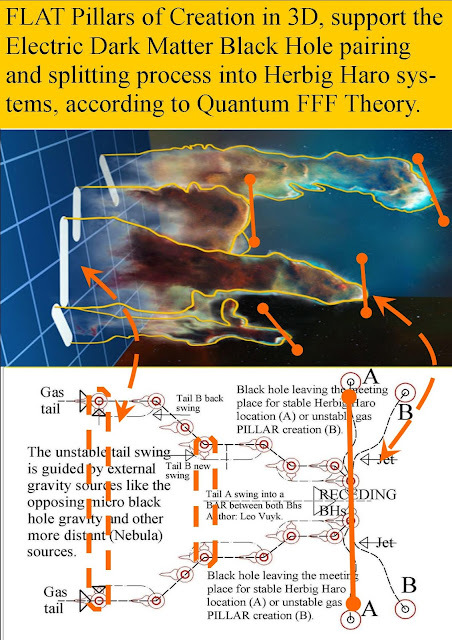 According to Quantum FFF Theory’s New physics. There seems to be reason to make some corrections to Einstein’s models. 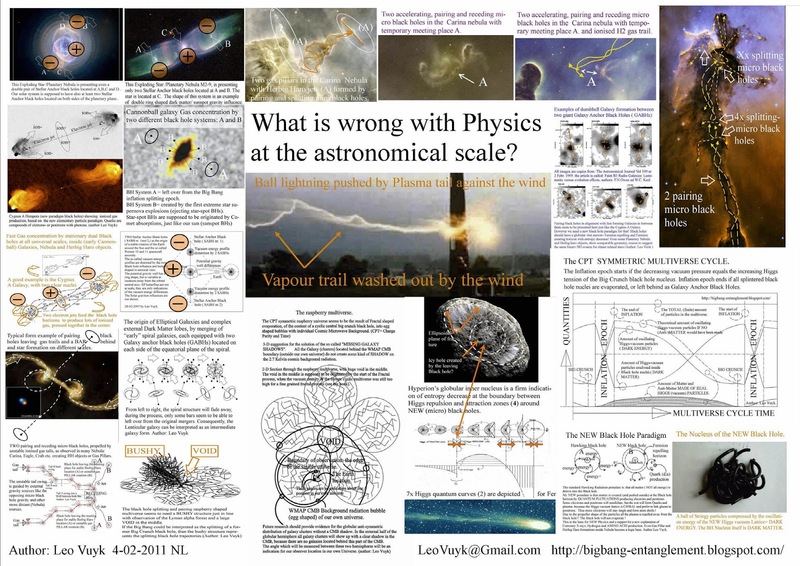 a whole new era of theoretical physics. 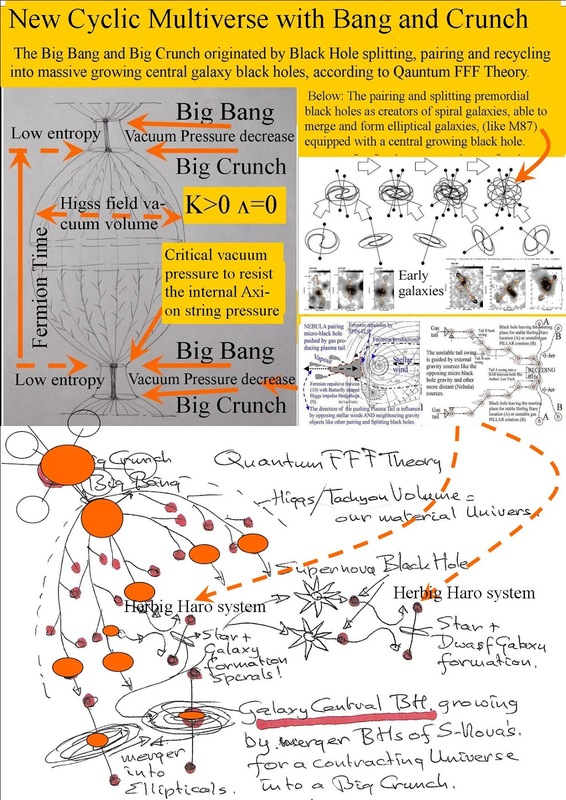 According to Quantum FFF Theory, Polarized Fermions (Nuclear Quarks) are supposed to be the origin of non accelerated motion through the resistive oscillating vacuum (Axion) Higgs field. 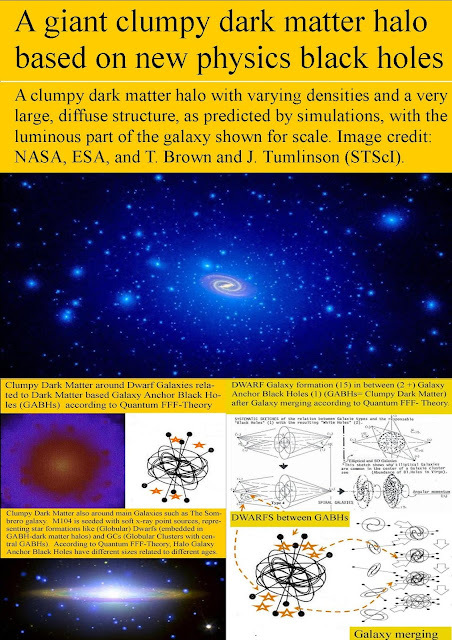 Recently B. Bucher et al. was able to find strong indications of polarized Fermions. 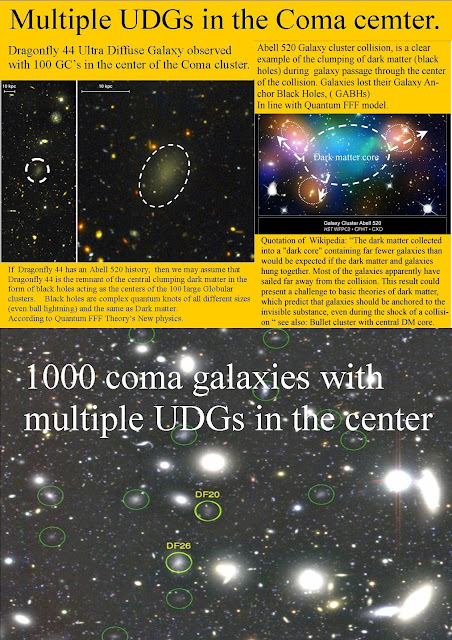 In addition: Dr Scheck says: "We've found these nuclei literally point towards a direction in spacetime". "Further, the protons enrich in the bump of the pear and create a specific charge distribution in the nucleus." 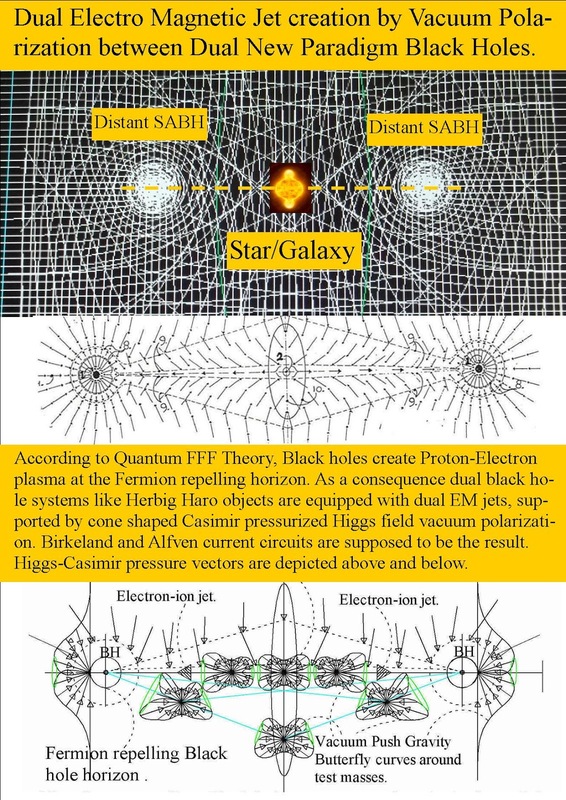 My suggestion is that the proton charge distribution should have such a shape that the resulting form of the electron shell should be in equilibrium and as a result the origin of the atomic Lorentz Fitzgerald contraction. 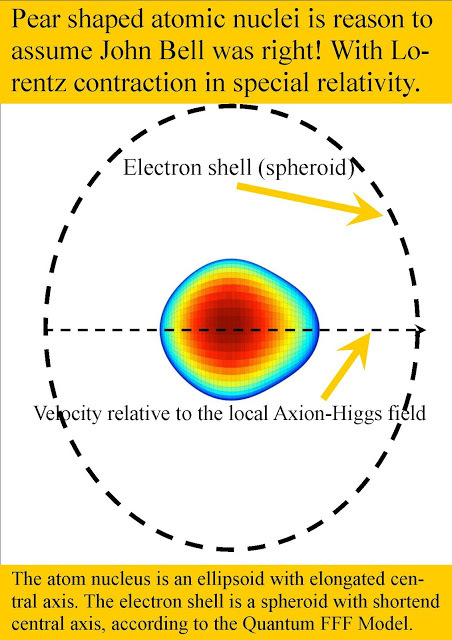 As an example, a disk shaped Proton charge distribution could be the origin of a disk shaped electron shell distribution as the origin of the Lorentz contraction effect . 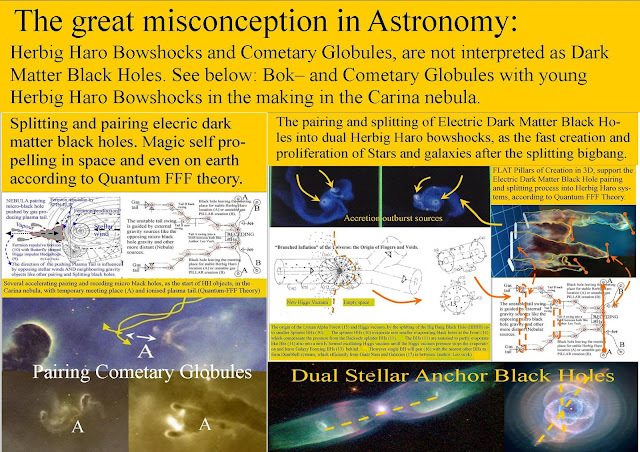 and this bias could explain why time seems to only want to go from past to present, and not backwards, even if the laws of physics don't care which way it goes. and proving that could usher us into a whole new era of theoretical physics. The study has been published in Phyiscal Review Letters, and can be accessed for free at arXiv.org. 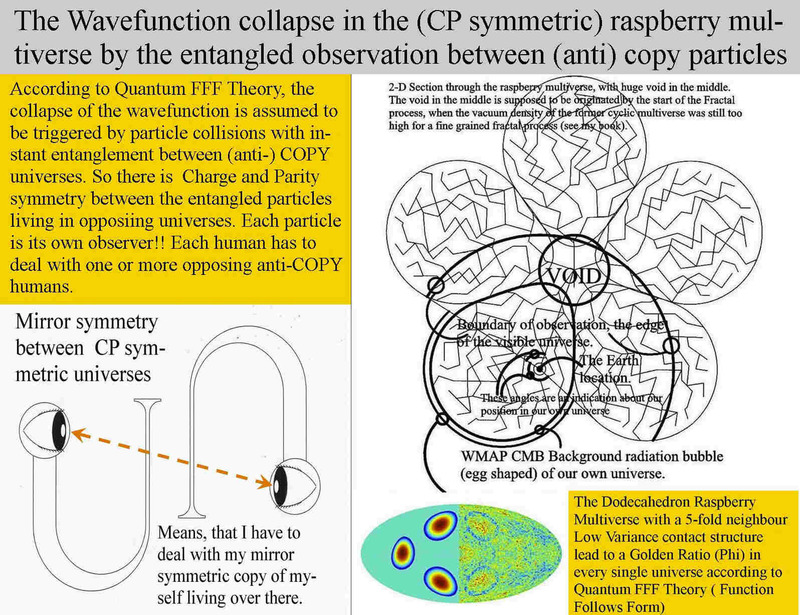 We live inside one of the CP symmetrical copy bubbles (universes) of the raspberry shaped multiverse with instant entanglement between copy Fermions spinning inside an oscillating resistive but also fermion pushing Axion-Higgs spacetime lattice. As a consequence, I suggest that strange deformation of metal objects like spoons done by Uri Geller could be supported by such a proton asymmetry effect. If Uri Geller is able to influence the nucleus by an unknown magnetic monopole radiation, then even levitation seems to be possible. This until now unknown magnetic radiation could be based on the monopole interpretation of the magnetic field explained in the Quantum FFF Theory. As a consequence,, The Uri Geller deformation of metal objects could be related to a external magnetic deformation of the nucleons in the same way as the Lorentz contraction deformation of the electron shells seem to do as suggested before. Even levitation can not be excluded if the pear shaping of Fermions could be external influenced in the same way. What are the main differences of Q-FFFTheory with the standard model? 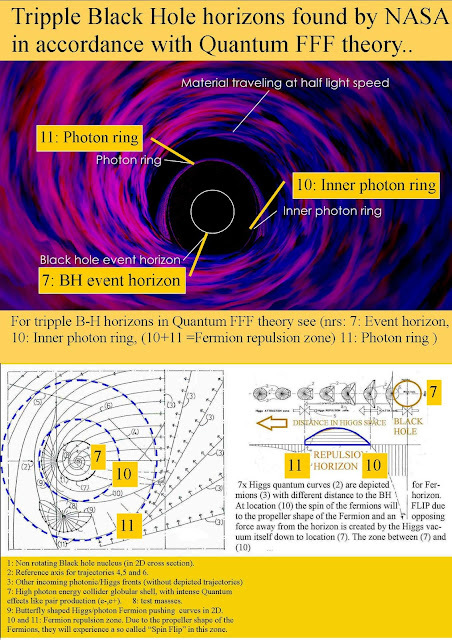 1, A Fermion repelling- and producing electric dark matter black hole. 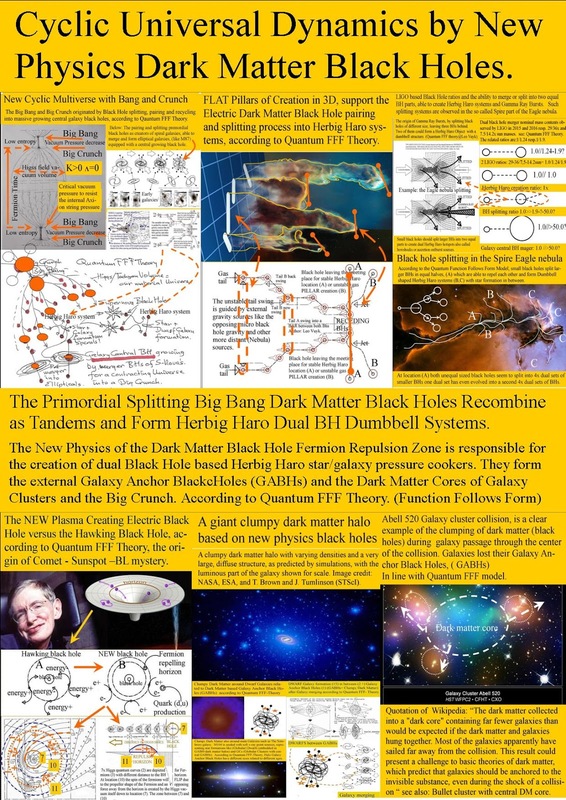 2, An electric dark matter black hole splitting Big Bang with a 12x distant symmetric instant entangled raspberry multiverse result, each with copy Lyman Alpha forests. 3, Fermions are real propeller shaped rigid convertible strings with dual spin and also instant multiverse entanglement ( Charge Parity symmetric) . 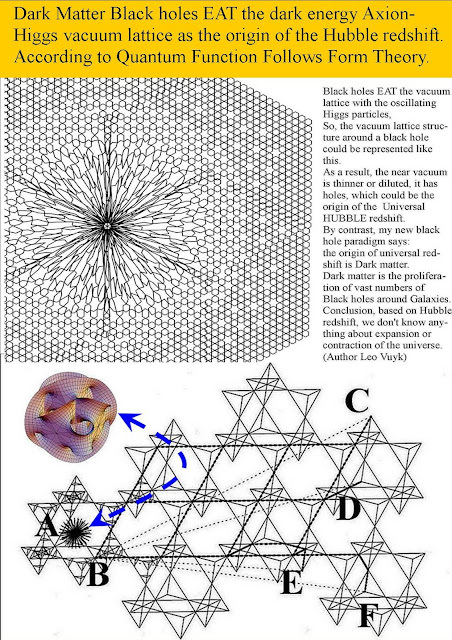 4, The vacuum is a dense tetrahedral shaped lattice with dual oscillating massless Higgs particles ( dark energy). John Bell argued that the motion of mass related to the surrounding vacuum reference frame, should originate real "Lorentz-transformations", and also real relativistic measurable contraction. Richard Feynman postulated the idea of an all pervading energetic quantum vacuum. 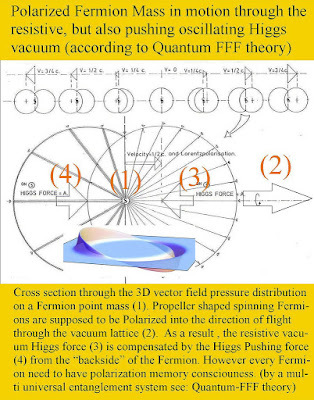 He rejected it, because it should originate resistance for every mass in motion, relative to the reference frame of the quantum vacuum. 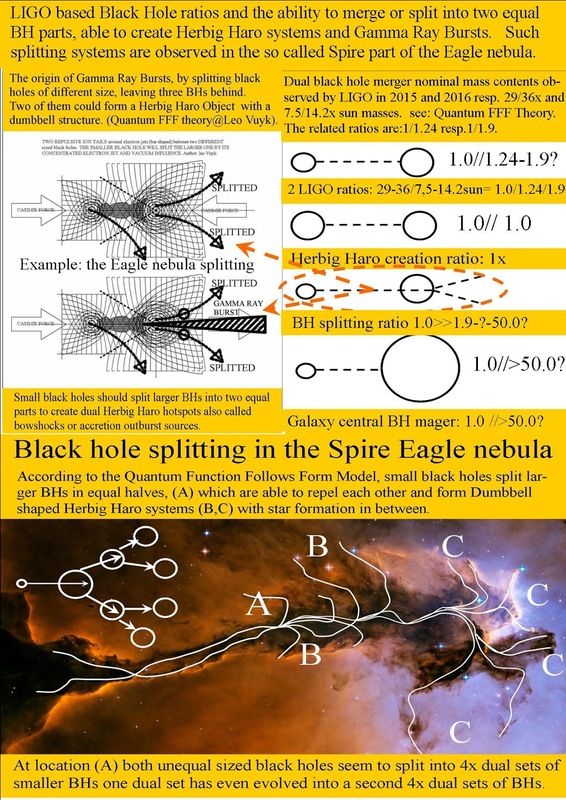 However, I postulate the strange and counter intuitive possibility, that this resistance for mass in motion, can be compensated, if we combine the ideas of Vigier, Bell, Bohm and Salam, and a new dual universal Bohmian "pilot wave", which is interpreted as the EPR correlation (or Big Bang entanglement) between individual elementary anti-mirror particles, living in dual universes. There is reason to make some corrections to Einstein’s models. 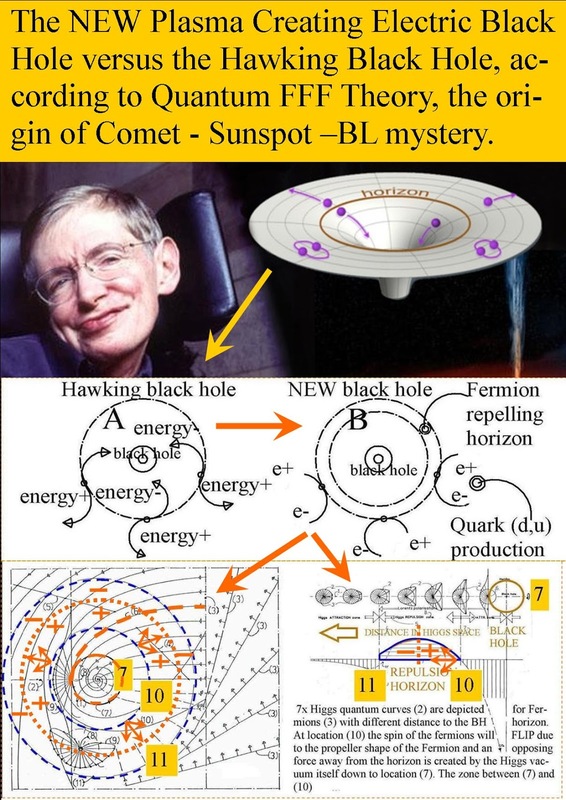 Even the lightspeed through the solar system and abroad, seems to be gravity related. See: Numbered listing of Vixra essays by Leo Vuyk. 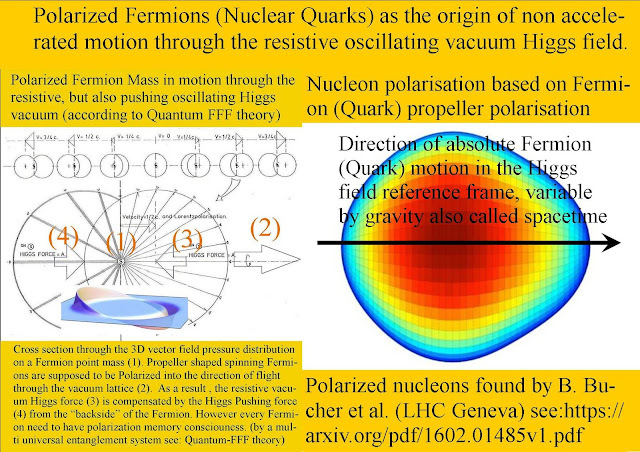 Polarized Fermions (Nuclear Quarks) as the origin of non accelerated motion. 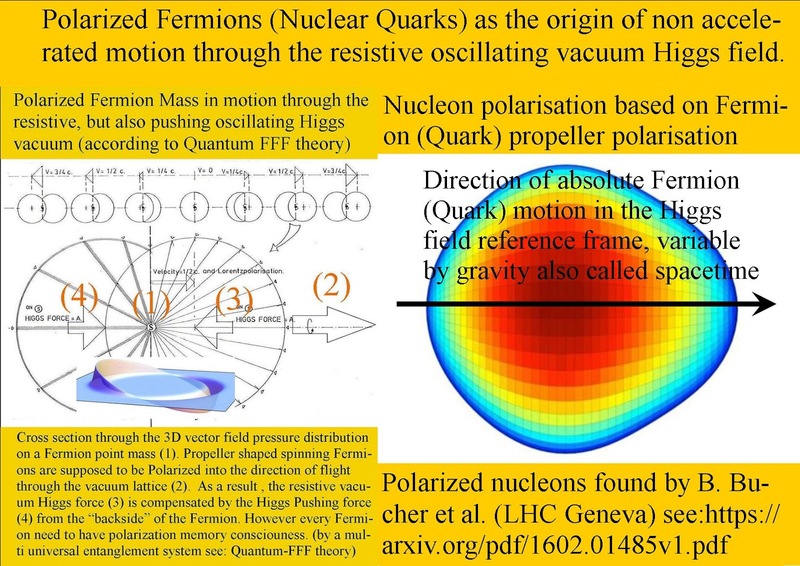 Polarized Fermions (Nuclear Quarks) as the origin of non accelerated motion through the resistive oscillating vacuum Higgs field. Dr Scheck says: "We've found these nuclei literally point towards a direction in space". 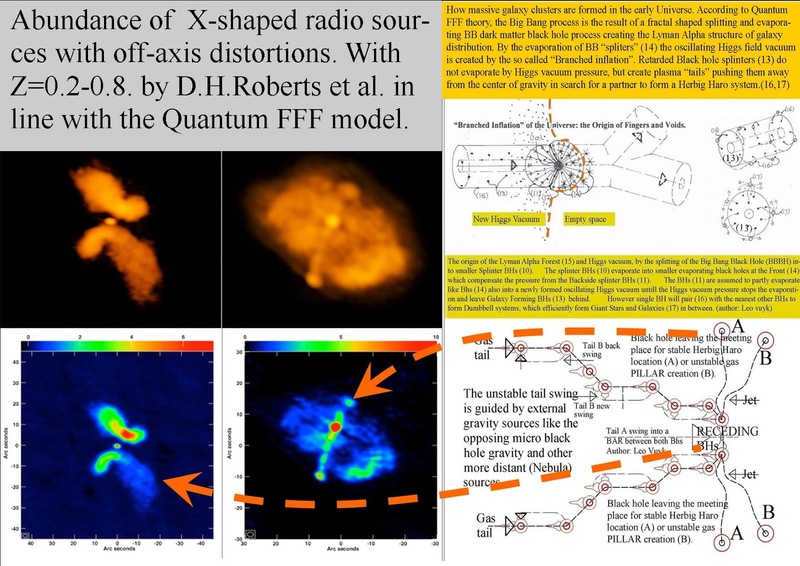 He says: "Further, the protons enrich in the bump of the pear and create a specific charge distribution in the nucleus. IMHO, this charge distribution should also be responsible for a disk shaped electron shell perpendicular to the direction of motion ( flight) and responsible for the so called " Lorentz contraction" of all objects into the direction of absolute motion through the resistive Higgs vacuum lattice. Attention: This is also against special relativity.strongly supported by John Bell in his essay "How to teach special relativity". A disk shaped Proton charge distribution could be called also the origin of a disk shaped electron shell distribution.as the origin of the Lorentz contraction effect . 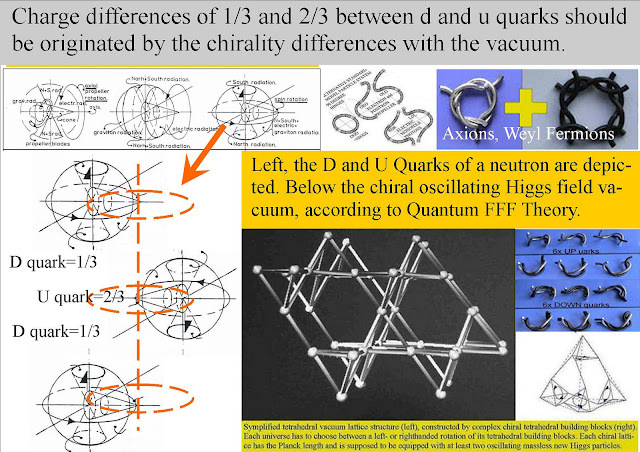 As a consequence,, The Uri Geller deformation of metal objects could be related to a external magnetic deformation of nucleons in the same way as the Lorentz contraction deformation of the electron shells of the metal atoms. The Christmas Burst of a neutron star between dual BHs.. The Christmas Burst. 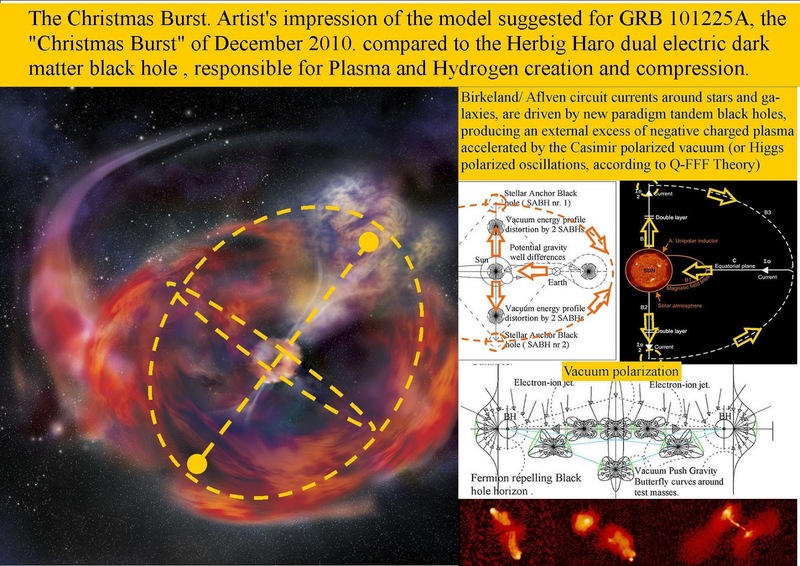 Artist's impression of the model suggested for GRB 101225A, the "Christmas Burst" of December 2010. compared to the Herbig Haro dual electric dark matter black hole , responsible for Plasma and Hydrogen creation and compression into a star. A solitary neutron star with a comet? 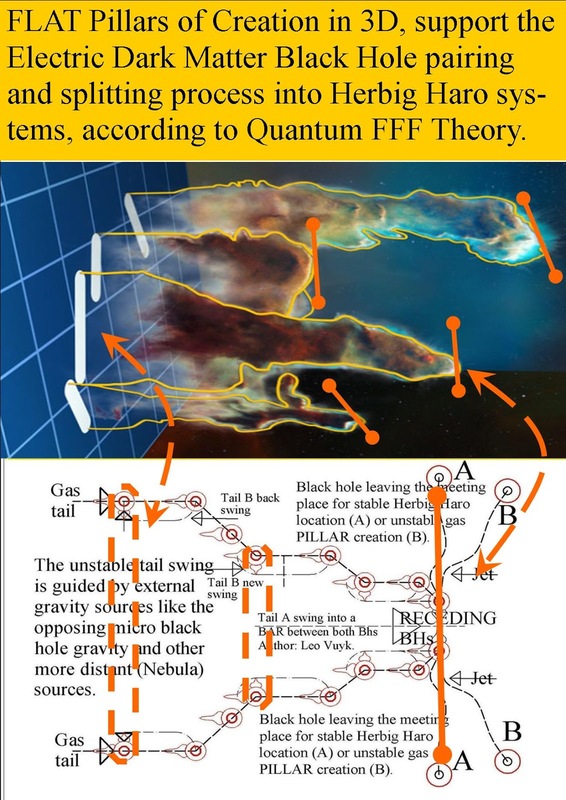 Not so according to Quantum FFF theory, as explained in the image. Telepathy can influence all our negotiations end treaties as Uri Geller showed us. You only need one experienced telepathic person who is able to read the minds of the opposite party. Democratic Free Will and Telepathy in the Instant Entangled Multiverse. Super-you: We’re all reading each other’s minds, all the time. 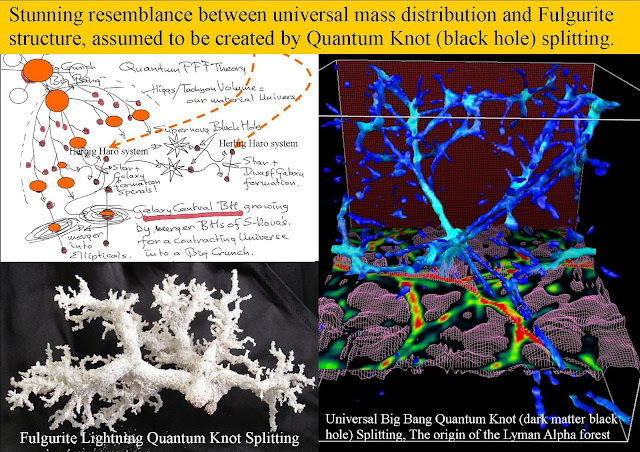 Lyman Alpha and Fulgurite Quantum Knot (black hole) Splitting Resemblance. The “volitional act” was in principle based on the free choice to press an electric switch button. The results of this experiment gives still an ongoing debate in the broad layers of the scientific community, because the results are still (also in recent experiments) in firm contrast with the expected idea of Free Will and causality. However I would propose the absurd but constructive possibility that we are not alone for decision making in a multiverse as an individual person. 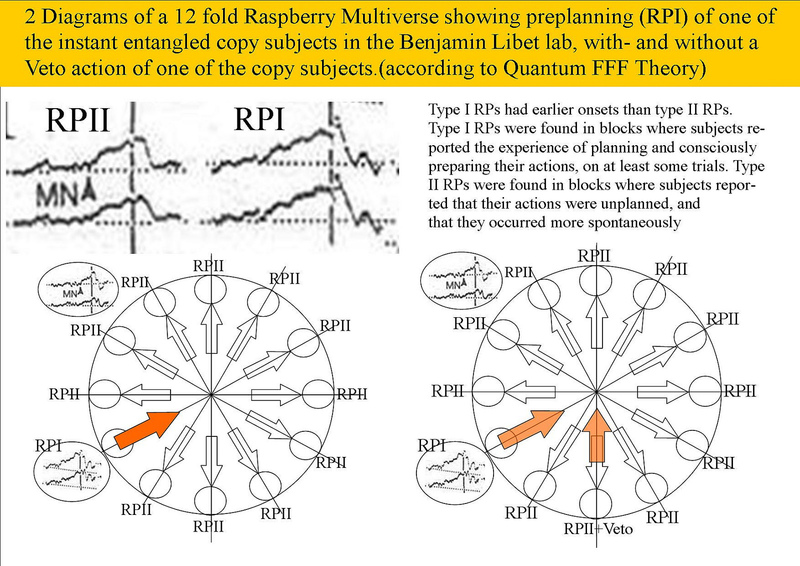 Even Max Tegmark suggested already about the multiverse: “Is there a copy of you reading this article?” We could be instant entangled with at least one instant entangled anti-copy person living inside a Charge and Parity symmetric copy Universe. 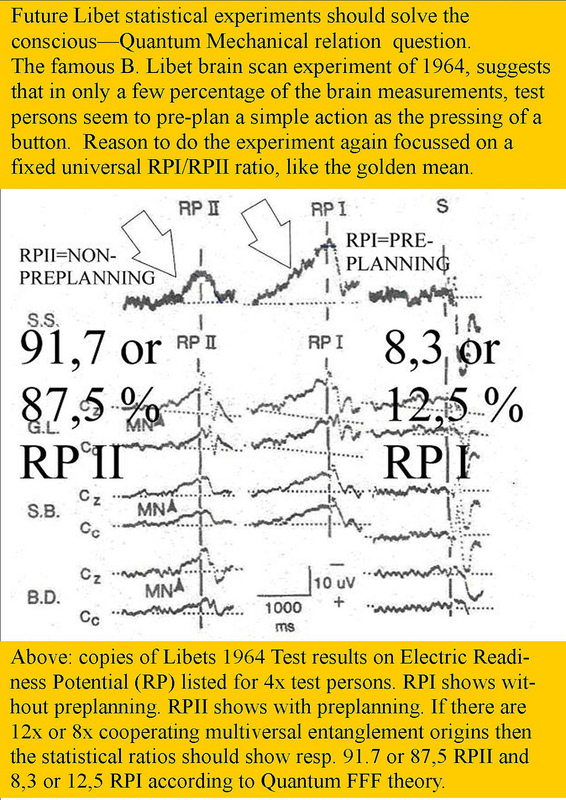 New statistical difference research on RPI and RPII of repeated Libet experiments described here could support these ideas. Wikipedia says: “Democracy is a form of government in which all eligible citizens participate equally”. 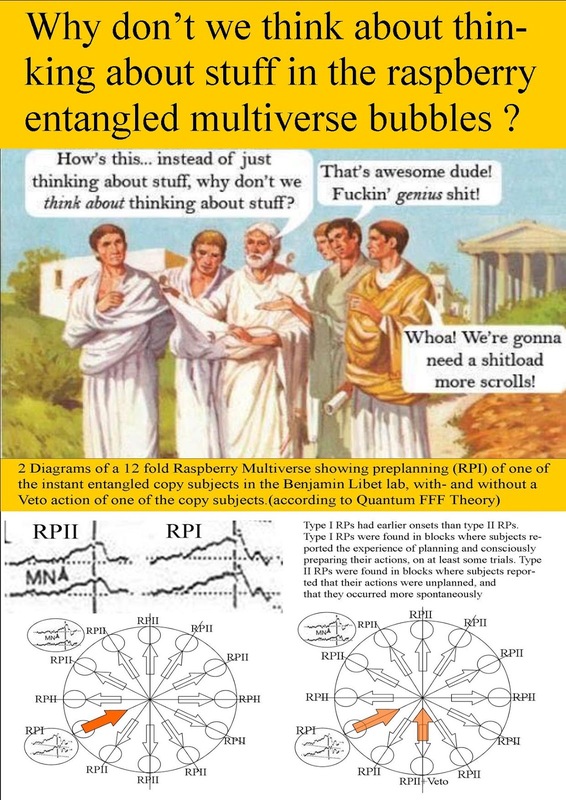 If I are able to “Tap into” those instant entanglement connections” sent out by other people, then even telepathic effects (mind reading) could be explained. 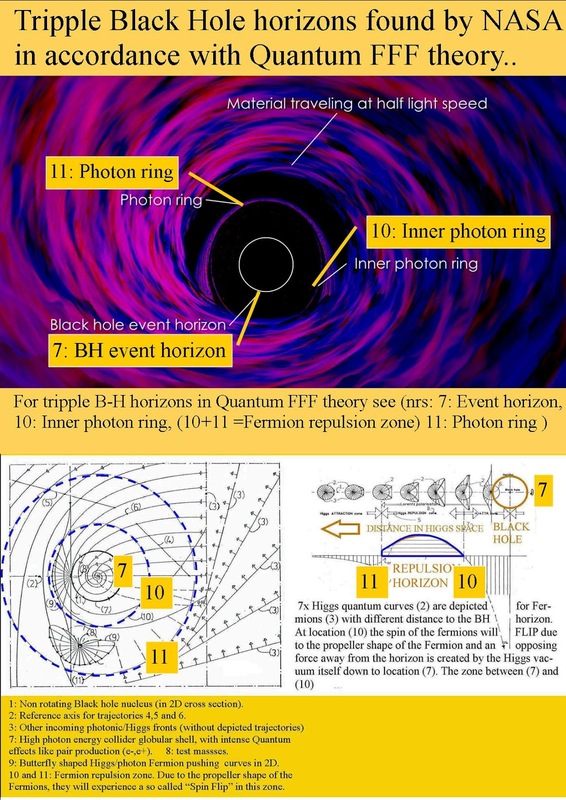 No fermion ( mass) created gravitons can escape from the black hole. 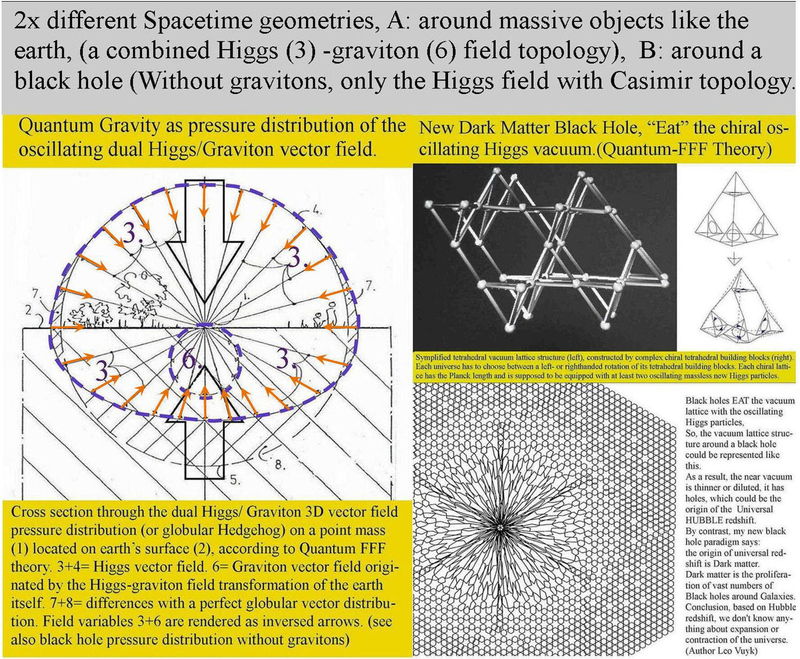 Only the pushing oscillating Axion/Higgs field vacuum is sucked in to the growing BH nucleus. Growing Black Hole nuclei seem to concentrate in groups travelling back from the Big Bang onto a Big Crunch, with LOW ENTROPY! 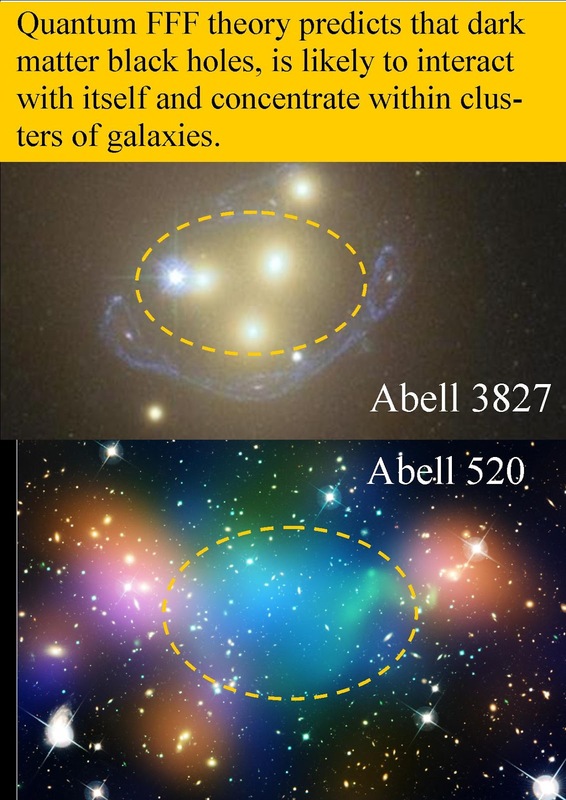 see: Galaxy Cluster Merging and Vacuum Absorption by black holes as a Support for a Contracting Universe. 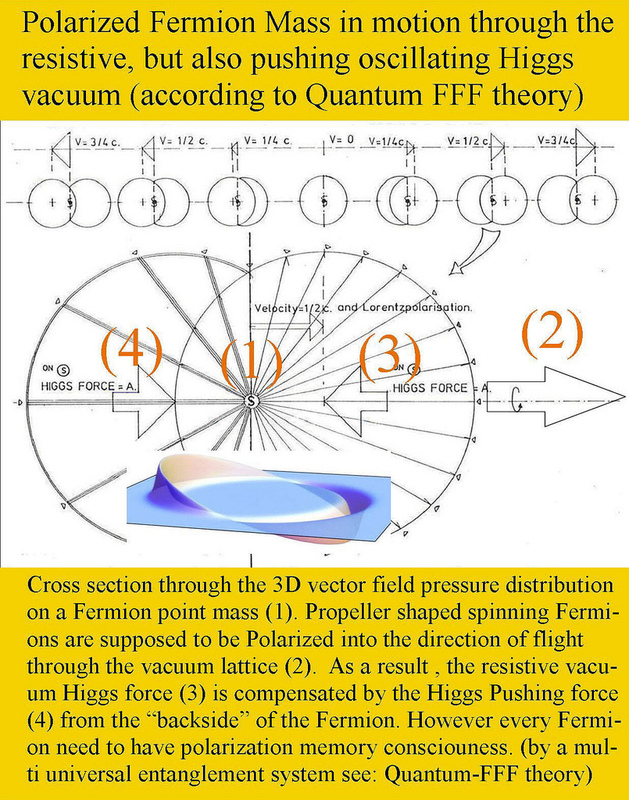 Gravity around a Fermionic test mass is based on two pushing force fields. 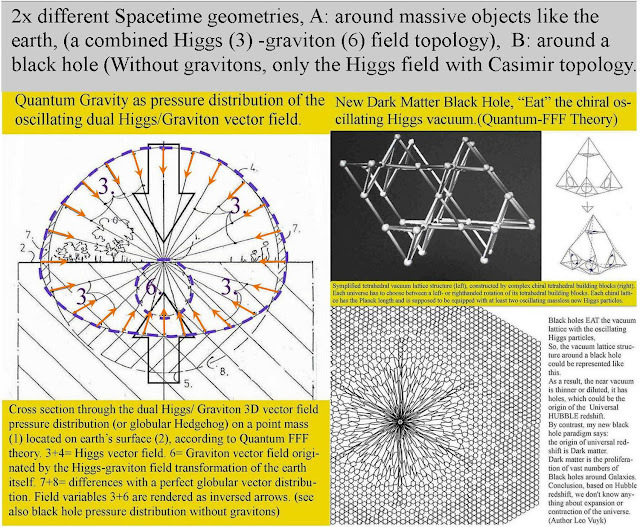 A Pushing Graviton field (6) and the reduced (Axion) Higgs field (3). 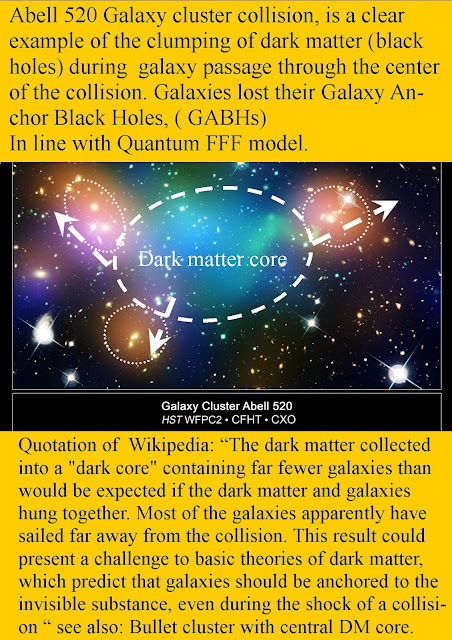 Dark matter black holes, is likely to interact with itself and concentrate. 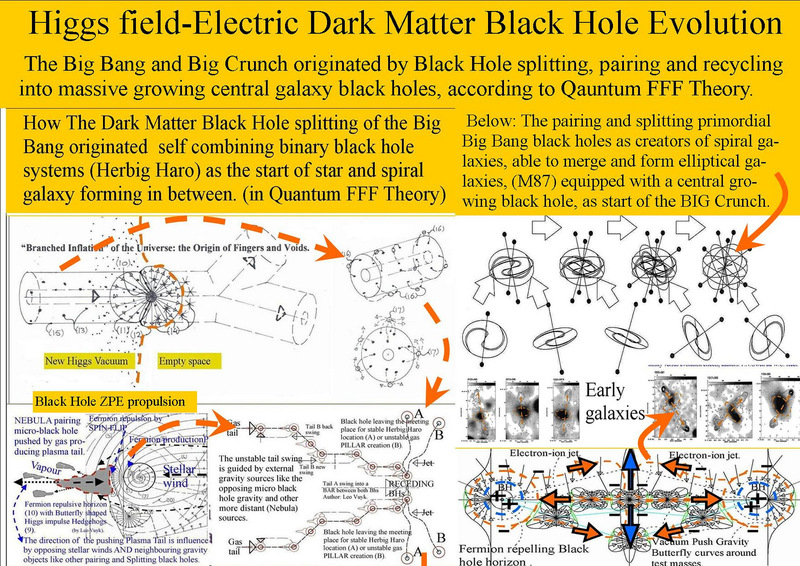 Quantum FFF theory predicts that dark matter black holes, will interact with itself and concentrate clusters of galaxies, as the start of the contraction of the universe into the big crunch. 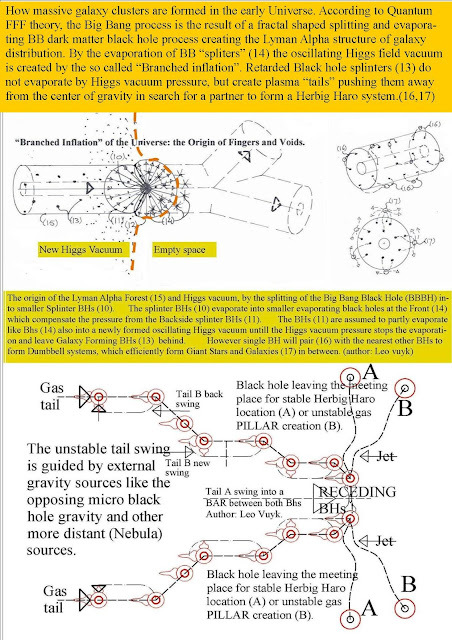 Black holes are supposed to decrease vacuum pressure by eating the oscillating Axion/Higgs vacuum rigid string particles. As a consequence dark matter BH bubbles tend to concentrate in groups. Different sized approaching black holes create different results as a base for the self organizing universe..
LIGO based Black Hole ratios and the ability to merge or split into two equal BH parts, able to create Herbig Haro systems and Gamma Ray Bursts. Such splitting systems are observed in the so called Spire part of the Eagle nebula. 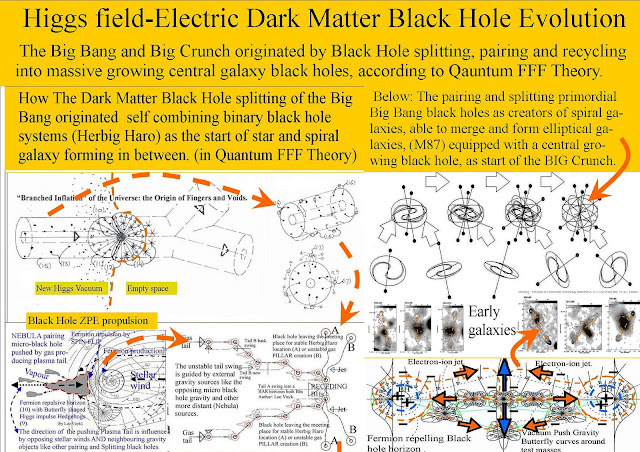 The new electric dark matter black hole of Quantum FFF Theory, seems to be the creator of new stars in HH systems but also feed central galaxy black holes as the start of a big crunch. The Firewall/ Fuzzball idea around Black Holes ( BH) could be explained, if fermions are real rigid string propellers, even able to be polarized mysteriously away from the BH, forming an extra repulsive horizon. How galaxies became massive so quickly after the black hole big bang splitting into smaller black holes. 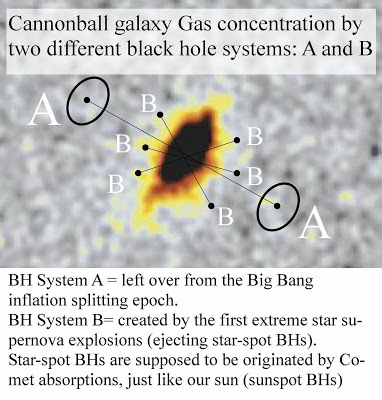 The answer: by the dual dumbbell black hole capacity to create and focus gas into the middle, pressure cooker alike to form "Cannonball galaxies" (A) see below. 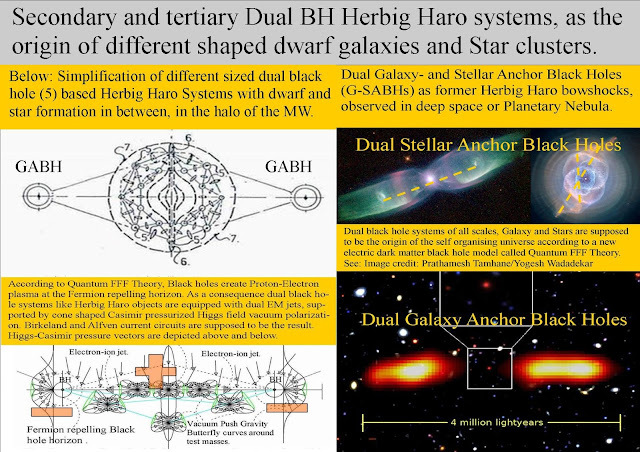 Later however these Cannonball galaxies create smaller supernova black holes forming systems like Herbig Haro (HH) systems (B) with a decreasing CENTRAL focused pressure cooker effect and less effective central star formation..
HH systems are supposed to be based on the strange capacity of equal sized black holes to form a dumbbell topology with star forming in between. 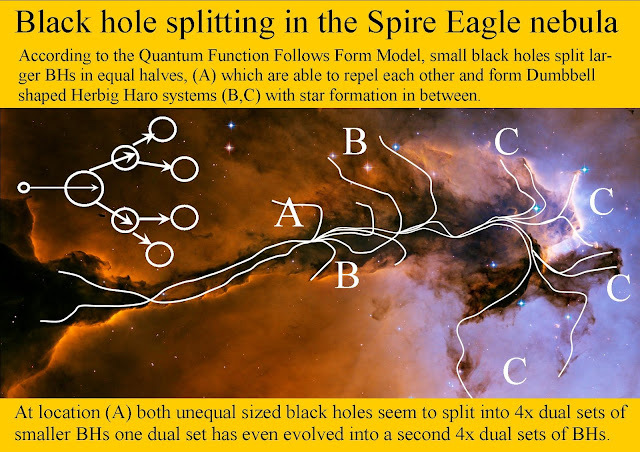 Equal sized black holes seem to be not able to merge!! Galaxy’s rapid growth spurt may have spawned 3000 suns per year. Quotation: "How do they get enough fuel to form stars so rapidly? " 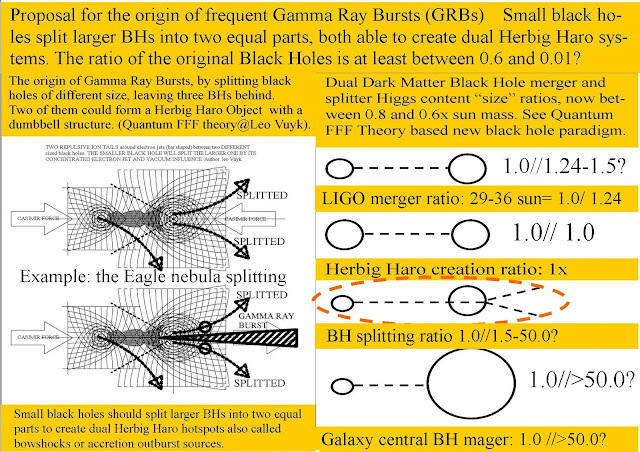 because all early galaxies feel the singular extra influence of the dual GABHs Galaxy Anchor Black Holes, splitted from the big bang BH.